Costas Laliotis, PASOK’s former general secretary, who was forced to resign by the party president and prime minister Costas Simitis, cast blame for his fall on the U.S. ambassador, Thomas Miller. Speaking at PASOK’s Central Committee meeting, Laliotis stated that he was punished because he had organized demonstrations before the Iraq war. This statement was viewed by political commentators as intended to hurt his successor, Michalis Chrysochoidis, and Foreign Minister George Papandreou, both of whom have good relations with U.S. officials. Mr. Miller had said that the references, made by Mr. Laliotis in his speech before PASOK’s Central Committee regarding interventions made by him, were ridiculous. Mr. Laliotis commented by saying that what Mr. Miller said is characteristic of him. Greece has a proud foreign policy, stressed Papandreou from the northwestern Greek city of Grevena. The statement was made when he was called to comment on the statements made by Laliotis, who spoke about an involvement of the U.S. factor in the party’s internal affairs. Referring to the government reshuffle, Papandreou stated that the prime minister made his choices and decided that hard work is needed to materialize significant work in all sectors. “Costas Laliotis was punished because he did not follow the Greek government’s complete alignment with [President George] Bush’s policy, and he brought PASOK’s followers into the streets in peace rallies against the Iraq war. With this major and provocative action, the full Americanization of the ruling party is being attempted, and this is equal to a national tragedy,” prominent Greek composer Mikis Theodorakis told the Athens daily Kathimerini. Speaking at the Central Committee meeting, Kostas Laliotis said he will not run for Parliament in the next election but indicated he will keep an eye on developments. In a speech detailing his twenty months as general secretary and his 29 years in the party, Laliotis indicated that he will not sit quietly on the sidelines. On Simitis, he told the Central Committee, “I respect his choices and his reasoning. But I disagree radically with his decision because I do not feel that I am an obstacle to his strategy for victory and PASOK’s renewal.” He likened his departure to the sacrifice of Princess Iphigeneia before the Trojan War. “I sincerely hope that with my sacrifice a tailwind will blow… and PASOK will win again,” he said. Kostas Laliotis rejected Prime Minister Simitis’ proposal for his return to the government, underscoring that he did not consider himself an obstacle to the ruling PASOK party renewal and course to victory in the national elections. He also hinted at being undermined by senior officials whom he refused to name. Being the only candidate, Public Order Minister, Mihalis Hrisohoidis was elected the new general secretary by an overwhelming majority. Among members elected for the Executive Office are Apostolos Kaklamanis, Fofi Genimata, Milena Apostolaki, Tonia Antoniou, Kostas Geitonas and Giorgos Panagiotakopoulos. 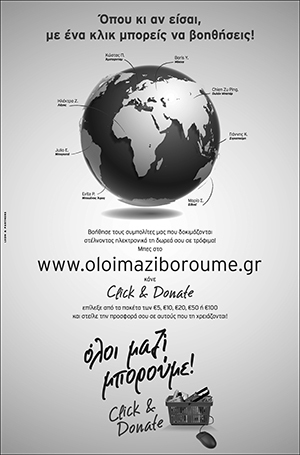 The initiative is part of a general shake-up promised by Prime Minister Simitis once his term as EU president ended. In a lengthy speech, Simitis said there would be a radical renewal of positions and policies focused on a single goal, “winning the polls.” Simitis also announced that a real social cohesion chart will be announced in September. It will comprise the basis of the PASOK party pre-election campaign aimed at increasing low incomes, reducing the cost of living and strengthening medium-size businesses. In another part of his speech he accused the main opposition New Democracy party of scandal-mongering and groundless promises.